Comedian Scott Moran launched a new “weekly documentary Web series” on Monday called “Modern Comedian,” looking into the on- and offstage lives of stand-up comedians. Moran, from Washington State and now based in New York City, posed his first examination this week at Kurt Braunohler (above), the host of IFC’s game show parody Bunk and longtime improviser and comedy partner with Kristen Schaal. We see Braunohler discuss his early comedy performances and overall philosophy toward making funny, which would put him easily in line with the grown-up kids at Improv Everywhere. We also see a bit of his current stand-up comedy and offstage hijinks. Don’t worry. Nobody gets hurt. Scott Moran told The Comic’s Comic more about the concept and his plans for Modern Comedian. How many do you have in the can already and do you plan for the series total? At this point I have four edited and about six more in the works. I’m aiming to make 10 episodes and call that a “season.” One episode I shot has the potential to be 20 minutes long, so I will either do a two-parter or maybe just release it in the longer form, not sure yet. We see Ben Kronberg is the focus of episode two. Can you reveal any other names in advance? I’m going to use teasers to reveal upcoming episodes. A next episode preview is my favorite part of a TV show. I will say there is a HUGE episode coming up that I just shot today (Wednesday) and I can’t believe it even fell into place. How much do you talk with each comedian in advance to scope out a plan vs. just interviewing them and seeing where that leads you? I always go into it with an idea in mind that we have talked out beforehand. Sometimes it’s my idea and sometimes, like with Kurt, it was his idea. He really came up with something great. The point of this series is to show the viewer something they didn’t know about a comedian rather than just a straight interview. It’s a slice of life. An episode can really be about anything, as long as it’s them and it’s real. Were there any other documentary series like this that inspired Modern Comedian? Two things come to mind. The first being the WTF podcast which in my opinion is THE podcast. I know there are a bunch of good podcasts, but I wanted to create something visual where you could learn about a comedian. Also Errol Morris, my favorite documentary film maker, was a huge inspiration. Future episodes will appear on Mondays. 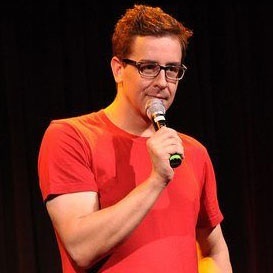 Fans can receive progress updates and news about Modern Comedian by following Scott Moran on Twitter @scottmoran9876.